Bill Thomas is a leading voice in the movement to change the way people experience aging, and he has focused on three solutions: architecture, culture and technology. 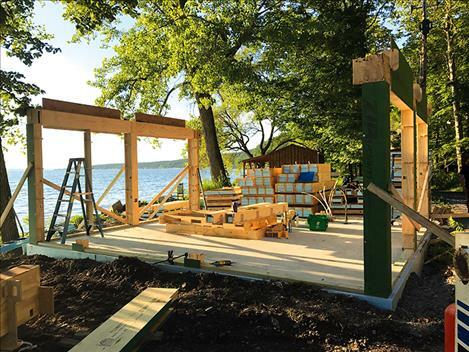 Thomas and Kavan Peterson are working on compact Minka houses — something between a tiny home and a standard house — that combine technology and architecture to enhance the well-being of elders and people with disabilities. 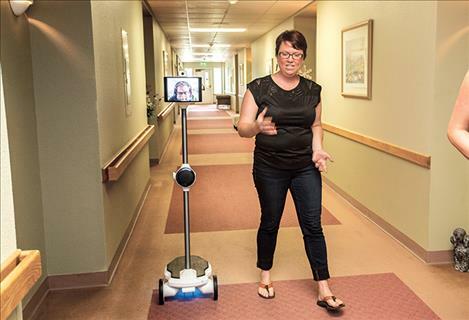 Kaley Burke and Bill Thomas showcase the Ohmni telepresence robot, which is being tested as a way to help connect residents at Missoula’s Grizzly Peak, a senior-living and retirement community, with loved ones who live far away. Residents gather in the community space of a pocket neighborhood designed by architect Ross Chapin in the town of Langley on Whidbey Island, Washington. 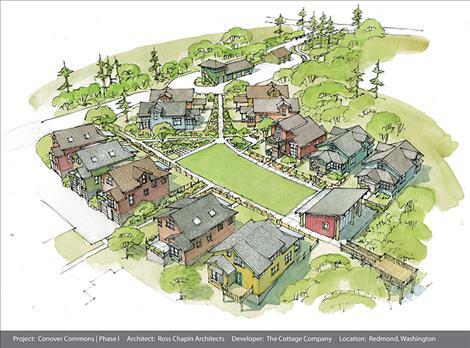 The plans for Ross Chapin’s award-winning Conover Commons Cottages in Redwood, Washington. After graduating from Harvard Medical School in 1986, Bill Thomas started working as the medical director of a small nursing home in central New York. It was a run-of-the-mill institution, “depressing and dispiriting,” he says. He was attending to an elderly resident’s rash one day when she looked up at him and whispered, “I’m so lonely, doctor.” Thomas says he had an epiphany. He realized the residents he was caring for seemed plagued less by medical issues than by boredom, loneliness and helplessness. Thomas met with the nursing home board and suggested that animals and plants be brought in. Lots of them. All at once. And so cats, dogs, birds and plants were carted into the nursing home in a single day. 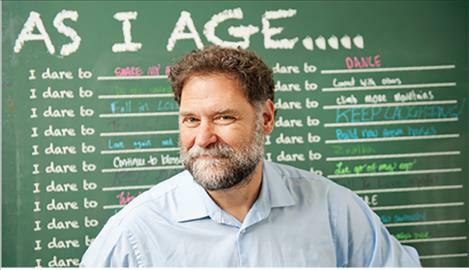 The burst of life that Thomas witnessed that day served as the first step of changing — or “disrupting” — what he has diagnosed as a failed aging system. What Thomas intuited in the early 1990s is today being affirmed by research. A 2015 study published in Perspectives on Psychological Science by Julianne Holt-Lunstad, a leading researcher at Brigham Young University, indicates that loneliness has serious health risks, including associations with dementia and heart disease, and should be considered a public-health issue. According to the Alzheimer’s Association, older people with dementia are more likely to become isolated, and are twice as likely as the general population to experience loneliness, because of the stigma and shame associated with the condition, and because social activities they once enjoyed often become inaccessible to them. Loneliness can multiply their already complicated health risks. Thomas, now an author and speaker who still lives in New York, and his colleague, Kavan Peterson, a long-term-care reform advocate and Missoula native, say the financial crisis is a symptom of a broken infrastructure of aging in this country, and a distraction from the real problem. If we can fix the system and reframe the culture of aging, they say, we can solve the cost issue and, more important, alleviate the mental health issues tied to isolation and loneliness that plague each generation’s approach to the end of life. In August 2006, a University of Minnesota evaluation compared the residential experience in Green Houses in Tupelo, Mississippi, to that of residents in nursing home environments. Green House residents reported a higher quality of life across the board, including personal dignity and relationships. Thomas and Peterson also run a website called Changing Aging dedicated to replacing bleak notions about growing old with positive narratives. It has been a difficult task. Most recently, Thomas has developed what he calls a “triple alloy” concept. It focuses on architecture (the built environment), culture (our attitudes about ourselves and the experience of aging) and technology (the tools we utilize to realize the lives we want to live). The effort to achieve triple-alloy solutions has not been easy. Green House projects tend to be expensive to start due to land and materials costs. And by themselves, they don’t address some of the cultural issues that contribute to the isolation of the elderly. Thomas and Peterson wanted to find some way to abolish the nursing-home model altogether. In June, Peterson and I took the ferry from Seattle, where he lives, to Whidbey Island to visit Ross Chapin, an innovative architect who has been written up in the New York Times, Wall Street Journal, Sunset magazine and a multitude of architecture magazines and northwestern dailies. Peterson and Chapin have met just once before, but Peterson is interested in how Chapin’s designs might help keep older people integrated in communities and out of nursing homes. Inside Chapin’s office are plans for neighborhoods across the country, including one that’s being built in Hamilton, an hour south of Missoula. The neighborhoods are customized to location. Chapin is most famous for his work on pocket neighborhoods, which are small-scale developments designed to foster community, an approach he documented in his award-winning 2011 book, Pocket Neighborhoods: Creating Small-Scale Community in a Large-Scale World. Chapin is especially interested in designing multi-generational, all-abilities neighborhoods that accommodate the needs of older people, including those with dementia, in a way that benefits the whole community. The homes are designed with both privacy and common space in mind, inviting neighborhood conversation and encouraging neighbors to look out for one another. Chapin has designed and built three pocket neighborhoods in Langley, a quaint tiny town on Whidbey Island. His Third Street Cottages feature eight houses on two-thirds of an acre, plus a common house, a central garden and a small playground. The carports are tucked away and inconspicuous. The porches face each other, but maintain semi-privacy with porch railings and greenery. Peterson says one reason older people end up in nursing homes, where loneliness and isolation can take hold, is a failure of architecture. “Ninety-eight percent of homes in America today are not accessible for somebody with any kind of physical disability,” he says. Riverside Crossing, the Chapin-designed neighborhood in Hamilton, is just breaking ground. It’s a housing cooperative community for people 55 and older developed by the Ravalli County Council on Aging and spearheaded by the council’s executive director, Paul Travitz. It features 51 cottages arranged in pocket neighborhoods and adhering to shared design principles. The neighborhood landscape is designed to accommodate and encourage walking and gathering. Also included in Riverside Crossing are two Green House-inspired multi-unit buildings that will offer supportive services and feature 10 small suites and shared living, kitchen and dining spaces. Chapin admits that such supportive living spaces are still difficult to design. Peterson finds his greatest challenge in these same questions. Kilka and his wife, Linda, ended up meeting Kavan Peterson, a Missoula native and co-founder of Changing Aging. They were inspired by his work on changing common and damaging narratives about aging and, especially, dementia. They went to work trying to change the culture surrounding dementia in Missoula, but Larry died of a stroke a year after his diagnosis. “He was so excited, and so impassioned about changing everything,” Peterson says. Peterson says he’s searched nationwide for models of dementia-friendly communities and positive-outlook programs to inform his work in Missoula. He landed in Seattle after hearing it was home to some of the nation’s best dementia and aging programs — not just formal networks, but informal groups, too. A network called Dementia Friendly America rates Seattle as a top model, but all you have to do is look at the city-wide plethora of dementia-friendly activities to see how pervasive they are. For instance, there’s a grassroots movement called Momentia, which Peterson has become involved with. It aims to help people with memory loss and their loved ones to stay active in their communities. Momentia activities, which have been developed by people with dementia for people with dementia, are published in a calendar and include Alzheimer’s cafes, cinema outings, garden walks and painting workshops. 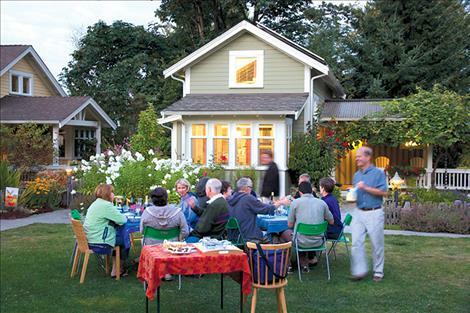 In addition, Seattle has fostered elder-friendly communities. The Village, for instance, is a network that includes a volunteer program in which young people help older people with, for instance, computers, and end up forging multi-generational friendships together. A study conducted by the Frye Museum and the University of Washington School of Medicine examined the ways in which arts programs like Here:Now normalize the way people with dementia and their caregivers feel within their communities. It found that such programs strengthen participants’ self-esteem and sense of belonging and recognition. Mary Jane Knecht, the Frye Museum’s program coordinator, says these activities have developed across Seattle organically, without coordinated direction, but it’s easy to see how they could be duplicated in other communities. Any place with a museum, a community theater, yoga classes or coffee shops could implement a Momentia component. “It’s about working with what you have, not re-creating a whole new system,” she says. Inside Missoula’s Grizzly Peak, a senior-living and retirement community, Kaley Burke is demonstrating something called the Ohmni telepresence robot. The robot is 5-foot-3 with a face like an iPad and the ability to turn in circles, traverse the ground (indoors or out) and nod its head. The Ohmni is currently controlled by Thomas, who often deploys the robot to visit residents at Grizzly Peak. Thomas sits at his home computer in central New York, but his face appears on the screen. It’s a concept similar to Skype or FaceTime, but the experience is significantly different, because the robot’s mobility makes it feel like Thomas in the room. “How are you folks doing?” Thomas says, remotely rolling the Ohmni up to a couple of people in the Grizzly Peak dining room. The Ohmni’s outings provide an opportunity for residents to ask Thomas questions about their health, but they’re also a chance to test out the robot’s possibilities. Burke, her brother Kavan Peterson and Jonas LaRance co-own an in-home care company called Harvest Home Care, whose headquarters are housed inside Grizzly Peak. They’ve all been testing technologies that can help decrease social isolation for older people. The aim of the Ohmni is for residents’ friends and family, who might live far away, to be able to log on and experience virtual visits with residents, virtually sharing meals or going on walks with them. Eventually, Burke says, family members could rent a robot on their end, allowing retirement community residents to virtually visit family and even attend weddings and other family functions. The robot is one of several technologies being tested through Harvest Home Care. Another is the MAGIC Micro-Visit Button, which is a box that can fit in the palm of a hand featuring a single button linked to WiFi. In most senior-living facilities, residents have to set up regular hours ahead of time if they want personal assistance to go shopping, do laundry or take a walk, and there’s usually a minimum reservation of three hours, for which residents have to pay at least $50. The MAGIC button allows residents to get quick assistance for an activity that might require only 15 minutes. They push the button and a signal is sent to nearby “care partners.” The resident gets an automated call to confirm the request, and then someone shows up to help them with whatever they need. Despite their interest in these technologies Thomas and Harvest Home Care are cautious about overselling technology as a remedy for mental health issues. Kavan Peterson says the elder-care industry focuses far too often on surveillance, which is meant to keep the elderly safe, but often perpetuates isolation and discourages community. For that reason, Peterson says, simple technologies are often the most profound. Broadband internet access is another technological lifesaver. In rural communities — in Montana and elsewhere — the extension of broadband internet could help change aging culture for the better by giving elders access to amenities like the Ohmni robot. Peterson says the problem is that tech companies aren’t focused on the mental well-being of older people. At tech conferences nationwide, which Peterson and Thomas often attend, all kinds of gadgets are hailed as the next big idea in elderly assistance. Some are benign but ultimately trivial, like a cane with an embedded FM radio. Others, like tracking devices for people with dementia, come with potentially unsettling privacy implications. The obsession with technology as a tool to change and even stop aging could cause harm to older people who are vulnerable to isolation. The upside of developing simple technologies that benefit an aging population is that they can just as easily be useful to anyone trying to create greater connection with their community. In their quest to promote well-being and positive mental health for older people, Thomas and Peterson are now working on a new endeavor: a residence called Minka, a Japanese term for “house of the people.” The compact home is an example of integrated technology and architecture, and features interchangeable parts designed to be user-friendly for everyone, including older people and people with disabilities. It’s also much cheaper than the Green House model. According to Sam Betters, executive director of the Loveland, Colorado, Housing Authority, an early and enthusiastic adopter of the Green House model, its $400 per square foot cost is a big drawback. The Loveland Housing Authority and Thomas and Peterson are working to develop pocket neighborhoods of Minka homes, and exploring the feasibility of building Green House homes using the Minka system. Thomas and Peterson are also partnering with the University of Southern Indiana, for which they’ve created a demonstration Minka home currently being built on the university’s Evansville campus. It will be a model with which students in geriatric and nursing programs can interact. Placing the Minka house on campus addresses the culture change issue as well. For Peterson, it plants a seed in an environment filled with young people, prompting them to think about the future of aging in new ways.